Yes, The Tick is back. This time it is on Amazon Prime and it dropped the first six episodes of season one this past Friday… and it was AWESOME! I was unbelievably thrilled by the series. Being a big fan of the animated series from FOX Kids and the short lived live action series, I was very happy to see The Tick become one of the pilots that Amazon put up last year as a potential series. Fans would vote to see if they wanted to see the pilot move to full series. I knew the Tick fans would come through despite the pilot itself being a little less than expected. 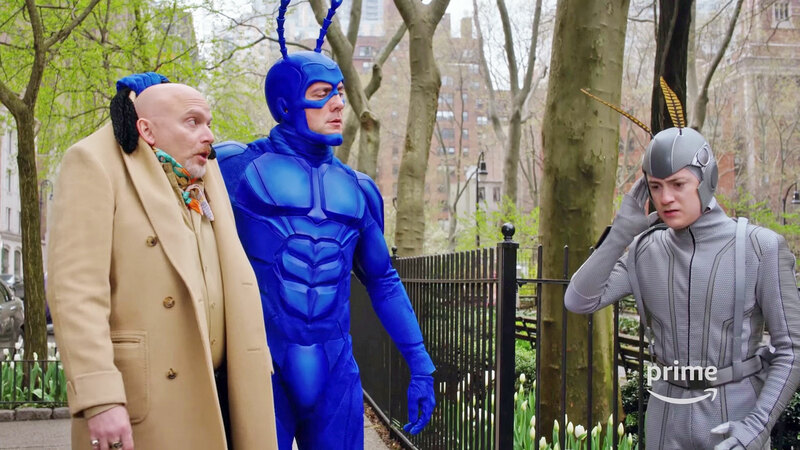 However, from episode two on, the Tick series was gold! So many great moments. It was laugh out loud funny. Peter Serafinowicz is perfectly cast as the Tick. His voice and innocent presence captures the character to a tee. Serafinowicz takes the best from Townsend Coleman and Patrick Warburton, the previous Ticks, and adds to the character. It is a singularly wonderful performance. Yet, the top performance of the show might just go to Arthur, played by Griffin Newman. Arthur is the driving force behind the plot, trying to prove that ancient villain, The Terror (the constant scene-chewer Jackie Earle Haley) is still alive and Newman fills the twitchy and neurotic Arthur with so much humanity that you can’t help but love him. And the episode six ends with the Terror yelling “Cliffhanger” after capturing Arthur. I can’t wait for more of this show. There are several of the meta jokes here. 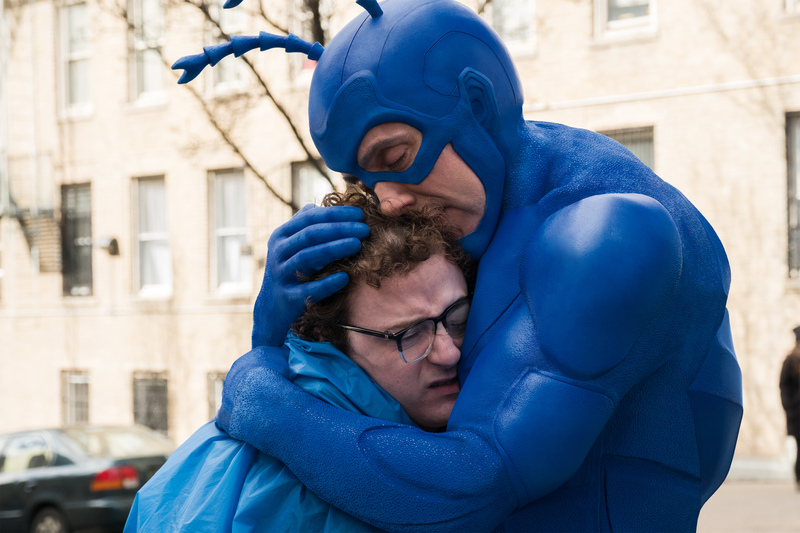 When the Tick design changed from the pilot to make him bluer and more flexible, Arthur said to the character of the Tick in episode two , “You look different” and the Tick responded, “Thank you.” Nothing further. I loved that joke. This show has become one of my favorites of the year. Twin Peaks is soon to be reaching its ending as last week we got episode 15, and we got what looked like a happy ending for Big Ed and Norma. I know, right. Who saw that coming? After all of these years, the chance to see these two original character with a chance to be happy really was a highlight form last week’s episode. We also saw Dougie watching TV when Sunset Boulevard came on the screen. When Dougie heard the name “Gordon Cole” mentioned in the film, something triggered in his subconscious and he stuck his fork into the wall socket. Could this electric shock be the final jolt to bring back Dale Cooper? I don’t know, but I sure hope so. There was also some tremendous scenes with the wonderful Log Lady. Margaret called Hawk and told him, “Hawk, I’m dying . . . You know about death—that it’s just a change, not an end. Hawk, it’s time. There’s some fear—some fear in letting go. Remember what I told you. I can’t say more over the phone, but you know what I mean. From our talks, when we were able to speak face to face. Watch for that one. The one I told you about. The one under the moon on Blue Pine Mountain. Hawk, my log is turning gold. The wind is moaning. I’m dying. Good night, Hawk.”. It was such a surreal and beautiful scene because the actress who played the Log Lady, the brilliant Catherine E. Coulson, who was a close personal friend of Twin Peaks director/writer David Lynch, was actually dying at the time of the shot. She was in bad shape with cancer, but she did come back to shoot these episodes for Lynch. RIP Margaret. Chip Esten made a return of his own, this time to Whose Line is it Anyway. Chip, who currently stars on Nashville, spent several years as one of the rotating fourth seats on the improvisation show, really showing his worth in musical numbers. He had not been seen with the crew since the last days of Drew Carey’s Improviganza. Chip seemed to step right in beautifully, performing with Wayne Brady and Jeff Davis in a version of Greatest Hits. Unlike most “special guests” on Whose Line, Chip was a welcome return and I hope we don’t have to wait for another 5 years before we see him again. SummerSlam was last Sunday night and it was a long and reasonably enjoyable show. However, the biggest match was the huge hoss fight that closed the show with Broick Lesnar retaining his Universal Championship against Braun Strowman, Roman Reigns and Samoa Joe. Braun Strowman looked like a star in this match and the crowd was firmly behind him despite him not being the face. 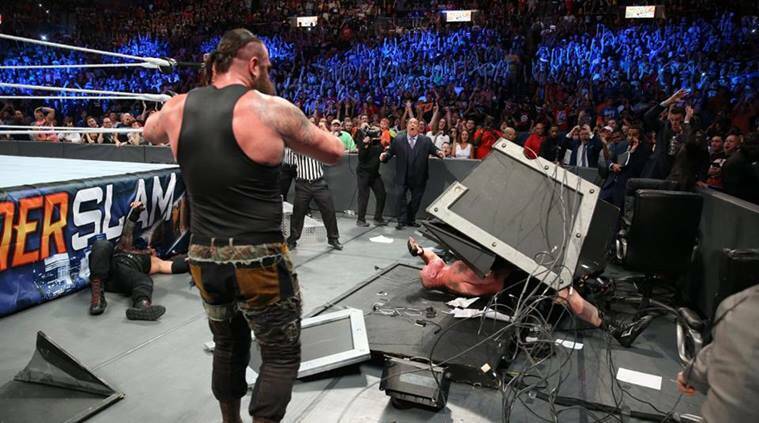 At one point, Brock and Joe were on the floor and, from out of the frame, flew one of the announcer’s chairs. It had been thrown by Strowman and it was really funny. Strowman was a massive beast, but Lesnar was able to survive by giving an F5 to Reigns. On RAW the next night, they announced a one-on-one match between Strowman and Lesnar for the next PPV, Hell in a Cell. On the SNL Weekend Update Summer Edition, we got another performance of Donald Trump from Emmy nominated Alec Baldwin. This skit was the cold open for the show and it made fun of the Arizona rally that was held this past Tuesday by President Trump. Baldwin came out with sunglasses on joking about how he had looked at the eclipse earlier this week (which the real Trump is photographed doing without any eye protection despite all the warnings.) It was great to see Baldwin again with his attempts to skewer the President of the US. 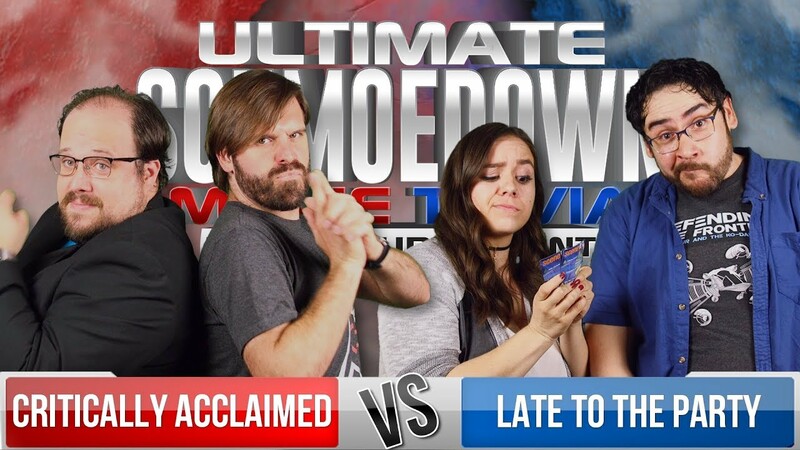 The Movie Trivia Schmoedown Ultimate Schmoedown Team Tournament has begun on Collider Video. The 16 team tournament will culminate with a new #1 contender for the Patriots, the team of “Little Evil” JTE and “The Insneider” Jeff Sneider in December. With round one starting, the first week saw a major upset as the team of fans known as Late to the Party knocked off tournament favorite Critically Acclaimed in a close and tense match. Other winners included Team Action over Deep Cuts, DC Movie News over Six Degrees and Team Trek defeating Cinema Blend. The remaining matches of round one will be completed and shown on YouTube next week. There was another Gong Show repeat this week. *SOB* I still watched the proper sing-a-long. Not sure what I am going to do when this goes away. Oh, I know that there is a Game of Thrones finale tonight. I am happy when TV Talk then does not have to talk about Game of Thrones every episode all week long. That is excellent. This Friday is the debut of Inhumans on IMAX screens. I am not sure if I will be able to see it yet, and I sure hope it is better than it appears.